TOP > EVENTS > Past EASTS Conferences > Here! 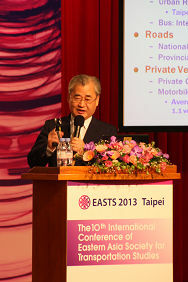 The 10th EASTS Conference was held in the Chang Yung-fa Foundation building, Taipei, Taiwan from 9 to 12 September, 2013. 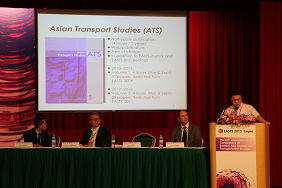 The Conference on the theme of "Towards a Harmonized Transportation Society" attracted 892 participants including 219 students and had 401 oral and 99 poster presentations covering all fields of transportation studies. The Conference Committee and the Local Organizing Committee in Taiwan did an excellent arrangement to attain the success of the Conference. The Conference provided all participants with great oportunities to enrich their professional knowledge and to experience wonderful culture in Taiwan. For detail about academic and practical papers, please see the website of International Scientific Committee (ISC). 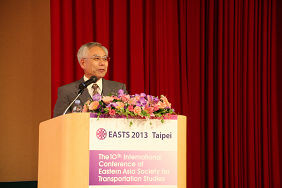 "Challenges and Suggestions to Transportation Professionals in Asia"
"Highway Safety, Social Equity and Environmental Sustainability: The Conflicting Objectives"
"Public Transportation Development in Taiwan"
*Keynote speakers' PPT is available at the Official Website of the Conference Committee. 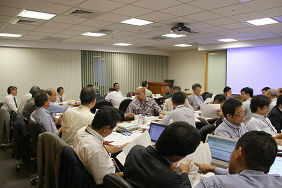 One Representative Assembly and three Board Meetings were held during the Conference. At the Representative Assembly Meeting, it has been approved that the number of "Directors-at-Large" is changed from 3 to 3-5. The Board of Directors approved "Society of Transport Engineers, Nepal (SOTEN)" as a new Member Domestic Society of Nepal. We are truly pleased to welcome. A Special Research Project between KOTI-EASTS has started. 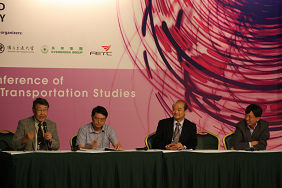 The theme is "International Comparison on High-Speed Railway Impacts and Station Area Development - Japan, Taiwan and Korea". As the first event, a Special Session (1) was held in this conference. 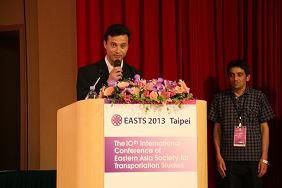 Memorandum of Agreement on co-hosting the EASTS 2013 Conference was signed by CIT (Chinese Institute of Transportation, Taiwan) and EASTS. 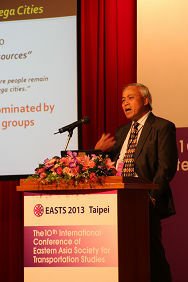 The CIT will provide financial support of USD 30,000 to EASTS in 2013. The EASTS will utilize the financial support from the CIT to all of the activities of the EASTS. The EASTS has begun preparing to hold EASTS 20th Anniversary events. 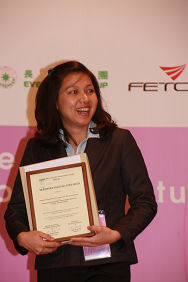 "Design of Transportation Service Auction under Time-cost Environment"
"A Study on the Use of Smartphones for Road Roughness Condition Estimation"
"Upward Safety Communication and Safety Behavior of Cabin Crew"
"A Numerical Study on the Influence of Aggregate Size on Skid Resistance Performance of Porous Pavements"
"Cross-sector Transportation Authority for Jakarta Metropolitan Area"
"Possibility of Crosswalk Design Independent from Signals at Basic Road Sections"
"Analyses of Route Choice and Route Switching Behavior Using Panel ETC Data from Tokyo Metropolitan Expressway"
"Smile and Behavior - New Evaluation Method for Pedestrian Environment"
"Introducing High Speed Rail (HSR) System in Developing Asia: Issues and Prospects"
*Awarding and ATS (sub-)Committee is in the International Scientific Committee (ISC). - To increase the utilization of public transportation. - The highest number of monthly inquiries was 614,300,000 times. 4 IRGs were completed in 2013 and 6 IRGs are ongoing. 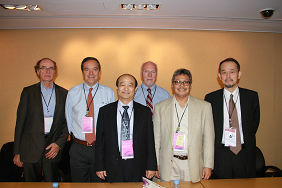 Furthermore new 5 IRGs were approved by the Board Meeting (see below). At the present stage, over 120 EASTS members are joining IRG activities. IRG-21-2013: "Comparative Study on Quality Management for Public Transport Systems in Asian Cities (QM4PTA)"
IRG-22-2013: "Integrated Sign Systems for Non-motorized Transport and Transit Users"
IRG-23-2013: "International Comparative Research on Value of Travel Time in Asia"
IRG-24-2013: "Viability of Public Transport Harmonizing System with Para-Transit Modes"
IRG-25-2013: "Mobile Millennium Asia: Mobile Productivity and Utility Tools for Inclusive Urban Mobility"
The 11th Conference will be held in Cebu, Philippines in 2015. TSSP (Transportation Science Society of the Philippines) will host it. Reported on 25 September 2013 by Naoyuki Tomari (EASTS Secretariat) with support of Naohisa Okamoto (EASTS Secretariat). Copyright 1998-2013. 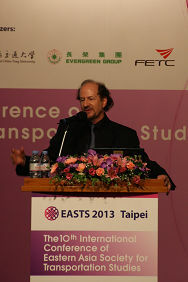 Eastern Asia Society for Transportation Studies. All rights reserved.